After trying out numerous vanilla flavorings (i.e., INW Shisha Vanilla, TPA Vanilla Swirl, FA Madagascar), I was still unhappy with the results. I wanted something to bring some serious depth to the vanilla from FLV Vanilla Pudding, without altering the texture that was already there. FA Bourbon (Vanilla) is an authentic spicy vanilla note that does wonders in this recipe. 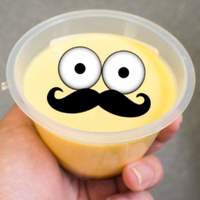 Pudding does have trace amounts of egg, and FLV Vanilla Pudding wasn't bringing that to the table. So I decided to use INW Custard at a low percentage. I think it blends into the profile enough that you probably wouldn't realize it's there without reading the recipe and adding it yourself. VT Golden Syrup was here from the very beginning of the process. It is an awesome flavor, and I wanted to use it for adding sweetness and nuance to the pudding. It started out at .5% and kept going up with every variation to the point it sits at now. The flavor is what I imagine happens to sugar used in a pudding recipe while it's cooked. It's not dark enough to be a caramel, but enough to add some delicious complexity to the mix. FLV Sweet Coconut is used to bring out some buttery richness from the profile. FLV Vanilla Pudding is the star of the recipe. When I first tested this flavor I honestly wasn't a big fan. However, after trying it out in other peoples' creations, I came around and embraced it. My opposition was most likely a symptom of expecting only excellence from a fellow pudding, and focusing on the flaws instead of the strengths. This flavor has an outstanding texture, and it is incredibly versatile in bakery and dessert recipes. Deeelicious! I had some doubt about FLV Sweet Coconut being used this way (FLV Coconut is the buttery one, and was the key to other tasty pudding recipes I’ve tried) but it really works. Together with the INW Custard, it makes for a smooth, sweet creamy pudding that’s thick and full without being as heavy as a custard. It's way more all-day vape-able than your average custard. The well-rounded vanilla depth is nice, too, but I think what's really kept me coming back is the way Golden Syrup gives it a natural, authentic sweetness that's perfect for a pudding. This is a really nice change from the heavy vanilla custards. The creaminess of the pudding really shines through everything. I love FLV Vanilla Pudding so I had to mix this up. The use of INW custard keeps this from being heavy and overly rich while adding some body to the pudding. The dark spicy vanilla bourbon also plays a big part in keeping this very vapable. You get a big vanilla bomb but its not too bright or cloyingly sweet and plays really well with the vanilla in the pudding. While I don't really notice the golden syrup and the coconut I'm sure they play a big role in bringing it all together. My only complaint is that this is a bit dry in the middle notes through about day 10 of steeping. After day 10 it works itself out and by 14 days it's perfect. Great mix! Very enjoyable. Delicious stuff. The vanilla here is bold, spicy, and deep. It weaves in and out of a rich and darkly sweet pudding base. I really enjoy the Golden Syrup here. It adds this complexity to the entire vape that is hard to put your finger on. That kind of flair keeps it interesting as you vape through the gallon you should have made. Sweet Coconut is used expertly, and it doesn’t make itself known. It simply boosts the creams in all the right places. I wound up letting this steep around two weeks, and it resulted in a smooth and satisfying mix. Thanks for sharing, Alfred! If you are looking for that sweet, creamy vanilla pudding recipe, look no farther! This is a smooth and flavorful mix. Alfred did a wonderful job of encapsulating all of the ranges of vanilla and cream with less calories! This would also make a nice pudding base to build off of for desserts.